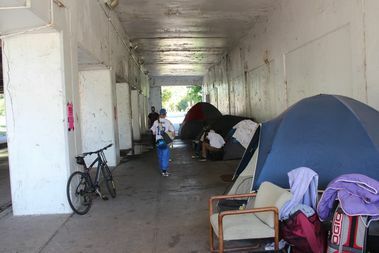 UPTOWN — The city wants to clean up the "unsanitary and unsafe" viaducts in Uptown, but homeless activists say it's just an excuse to give those living in tents there the boot. Two weeks ago, Chicago police and staff from the Department of Family and Support Services blanketed the viaducts at Lawrence, Montrose and Wilson with off-street cleaning notices, warning that items will be discarded if left on the street during the cleaning at 10 a.m. Friday "or any late date or time," according to the notice posted to tents and other possessions under the viaducts. The cleanings will be ramped up after a sporadic summer schedule. “The City of Chicago is committed to ensuring residents have access to clean and safe communities and public space — which is why tomorrow we will resume cleaning at select viaducts based on a recent evaluation by the Department of Public Health that found conditions under the viaducts to be unsanitary and unsafe," said the Department of Family and Support services via email Thursday. "Based on this report and at the urging of the surrounding community, we are moving forward with a more consistent cleaning schedule at the viaducts that will provide cleaner conditions and protect the health and wellness of the residents who reside there as well as those who live nearby," the department said. While the city said the cleanings took place after cockroaches, feces and rat traps were found under the viaducts, activists say the threat of removal is problematic. Activists said they were verbally assured by the city that tents would not be thrown away, but they said the mere threat of destroying possessions "needed to survive the oncoming winter" was worrisome. "This city has broken so many promises about housing the homeless underneath Lake Shore Drive, replacing torn down CHA housing, and ending homelessness in general that verbal assurances aren't good enough," said Ryne Poelker, a homeless advocate and activist with North Side Action for Justice. 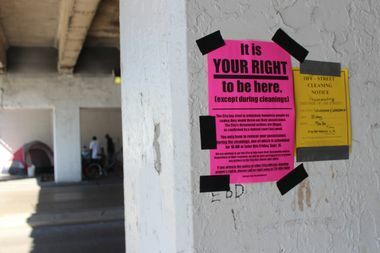 Activist have also posted their own notices in the viaducts, informing the homeless of their rights and promising to monitor the Friday cleanings, said the release from the North Side Action for Justice, No TIF for the Rich, Uptown Tent City Organizers, and the Gay Liberation Network. "Being homeless is stressful enough, especially when combined with mental health issues that many homeless people have. It is barbaric for the city to add to that anxiety and fear by illegally threatening to force them out and destroy their possessions. This is the exact opposite of the kinds of help our homeless neighbors need," Poelker said. Off-street cleaning is a common occurrence, according to the city, and while it seeks to balance "the needs and rights" of everyone who uses public property "including the homeless," no one has the right to store personal possessions on the public way for any period of time. Citing lawsuits in Los Angeles and Chicago, the destruction of homeless property has been deemed "unconstitutional," said activists, adding the city is "wasting taxpayer dollars that would better be invested in affordable housing rather than attorneys and court penalties." 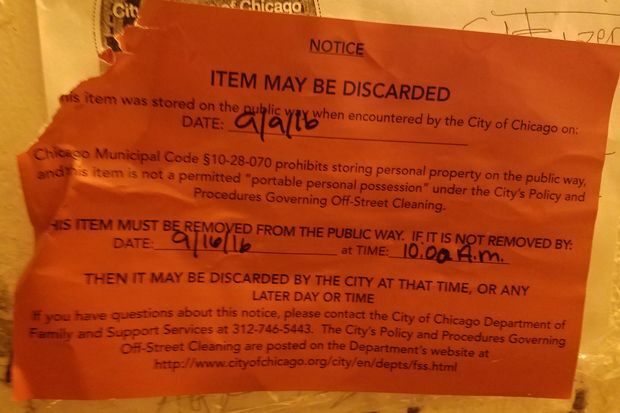 In September, a Cook County judge ruled against dismissing a lawsuit filed by a homeless man living in the Near West Side, who had his property including prescriptions and blankets thrown away by a city street crew. The ruling allows the Chicago Coalition for the Homeless and their co-counsels to continue with case, which was filed in March. Tony Avery, who has lived under the Lawrence Viaduct for about a year, said last Friday police "put notices on things and said if it ain't moved it's trash... Sometimes they say stuff like that, but we have people looking out for us,"
While the threat didn't scare him, it did scare some of the newer residents of Tent City, he said. "It's a regular thing," he said, adding the cleanings occur every few months. "We just make sure we're here at the time and don't come back" until after. For Avery, the cleaning brings back memories of when the viaducts were cleared ahead of a Mumford and Sons' concert last year. After clearing out the viaducts, the encampments moved to the surrounding park land, where they were forced to deal with the Chicago Park District, he said. "They don't want people down here when there's a lot of traffic," he said. "It's always something."